In various Scrum books I have read, the authors suggested to have slack time in between sprints. As I was quite new to Scrum, I was not familiar with the concept of slack: It came across more as a relaxation period: you can't sprint all the time, and need to regain strength for the next sprint. But there's more to slack: Tom DeMarco compares it to an open space in an 8-tile puzzle (here's an example of such a puzzle). He recalls the 1990s trend, when organizations rationalized middle management for the sake of efficiency: Using the puzzle metaphor again, this situation would equal a 9-tile puzzle with no open space at all! The result is high efficiency, but change has become impossible: People are just too busy with operational work to think about the future. Slack is the time when you are 0% busy. You have time to reinvent yourself and experiment. Think about it in a Darwinistic way: If there was no mutation, life could not adapt to changing circumstances. Mutation is slack. Without mutation, every species would be doomed, without slack, your company is probably too. The only thing permanent now is change. This is why slack is seemingly becoming more and more important. Not only Google is doing it, but many others too. It's not a luxury, not about being nice to your employees, it's about assuring to still be able to compete in the future. 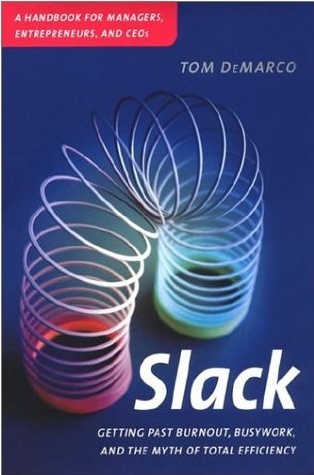 The book consists of four parts, the first introducing the concept of slack, and the second being about the consequences of no slack. In the third part, the author illustrates opportunities that possibly coincide with slack, with the final part being about risk management: It reminded me of an agile guideline, embrace change. After all, without risk everybody could do what your business does. Summing up, I would definitely recommend the first part of the book. It has some great metaphors and a concise summary of the authors ideas. The rest of the book feels somehow bloated, although interesting thoughts pop up occasionally. But for the first part alone, I recommend it, it has profoundly changed my view on slack. Funny side note: In the introduction the author says, he has adjusted the book so that an executive could read it during a flight from Amsterdam to Rome. Either he's talking about another Rome on a remote continent, or these executives must be pretty fast readers.